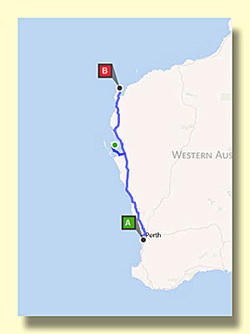 For 1,300 kilometers (800 miles) north of Perth Australia's west coast has one entertaining stop after another. We did it in a week, and could have spent several months. In fact, many RVers do spend several months each year along this coast, it's very popular with the Australian Snowbirds, called Grey Nomads over here. The first night out of Perth we didn't really have a destination in mind, but when we saw the sign for this park it rang a memory bell and we decided to stop. The park is well known for an evening flower tour by the owner, Allan Tinker. He could talk for days about the flora of the area, and you'd stay to hear it all, even if you didn't have any interest in the subject. Most evenings, however, he holds it to an hour or so - and you wish he'd keep talking! 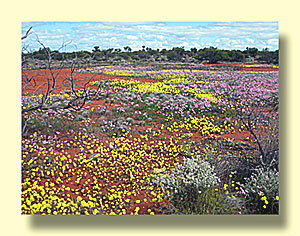 The west coast north and south of Perth is famous for its wildflower displays during the late winter and spring. Although that's when we were visiting, not all areas have a lot of flowers, and the area around the RV park wasn't really full of flowering plants when we were there. Despite that we had a great tour, the local plants are fascinating even when there isn't much in the way of flowers. The tour ended with a microscopic look at several tiny blooms collected along the way. You'd be amazed at how many little bugs occupy even one blossom! 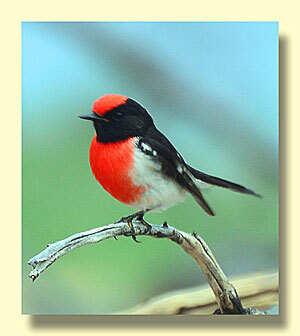 Western Flora Caravan Park website. 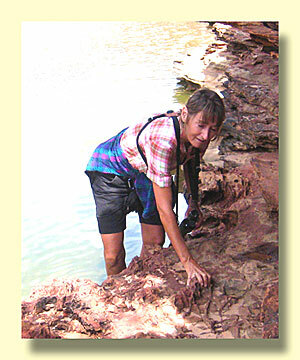 The little town of Kalbarri sits on the coast about 600 km north of Perth. 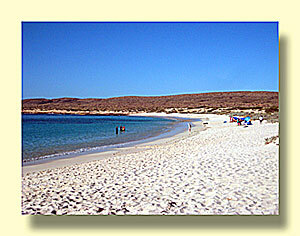 It's at the mouth of the Murchison River and has a nice beach and several campgrounds. Very visitor friendly. 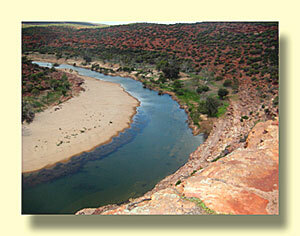 For us the attraction is inland, the Kalbarri National Park. 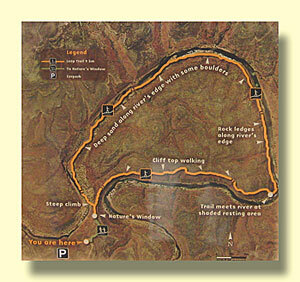 We passed a day hiking the Murchison River Gorge. One of the best day hikes we've ever done. You have to travel a bit off the main highway to reach Shark Bay, but it's well worth the effort. Access to the eastern bay is possible at two different places, and they couldn't be more different. Monkey Mia is a resort and caravan park on the west side of the bay. 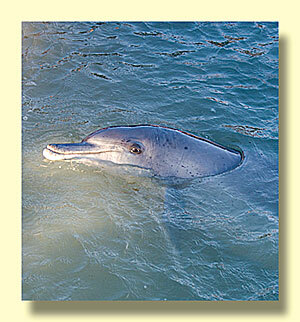 The place is famous for daily visites by bottlenose dolphins. People line up along the beach early each morning and when the cruising dolphins spot them they come right in to the beach for breakfast. The second access point is at the shallow southern end of the bay. There, at Hamelin Pool, you'll find a dock that lets you walk out for a close look at the stromatolites, one of the world's oldest life forms. 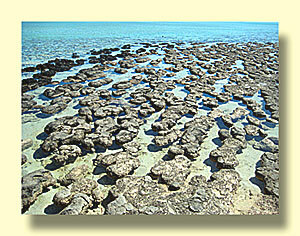 More about Hamelin Pool and Stromatolites. 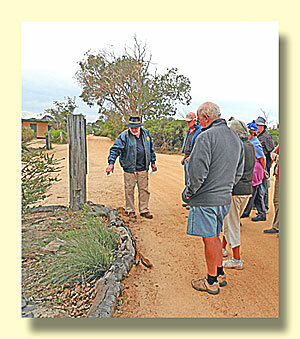 Exmouth requires another jog off the highway. The attraction here is Cape Range National Park where Ningaloo Reef is easily accessed by tour boats or even snorkelers from shore. 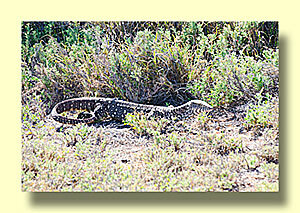 More about Cape Range National Park. More about the Ningaloo Reef. 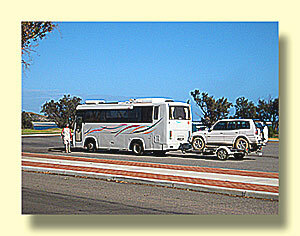 Here's a nice Grey Nomad rig in Kalbarri. 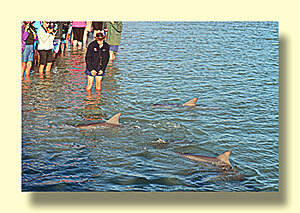 The Grey Nomads are the equivalent of our Snowbirds, except that they travel north to find warmer weather.